Not for the first time, a high-level UK strategy is landing most heavily on the people on the ground. Britain's ground-based air traffic control system is switching to one using satellite technology. 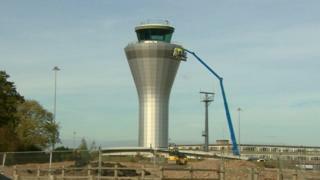 The Civil Aviation Authority says this will make more efficient use of the UK's airspace. In common with all Britain's major airports, Birmingham is required to modify its flight paths, reducing the number of available routings for aircraft flying in and out. No airport can ever be a perfect neighbour for everyone of course: especially for those in areas set to see more flights overhead, while others see significantly fewer. It's take-offs from Birmingham's northerly runway that all the fuss is all about. There are currently four standard departure routings: sharp left over Birmingham's south west suburbs including Edgbaston, north west towards Walsall, north towards Sutton Coldfield, or south east via a right-hand U-turn. The new streamlined routings would remove that north westerly track, concentrating more take-offs over the ones that remain. To explain the changes, the airport have organised 14 public meetings over 17 weeks. The last one, at Harborne in Birmingham's Edgbaston constituency, was one of two repeat visits. Such is the strength of feeling among those communities expected to see more aircraft flying above them that the consultation period, due to end last week, has had to be extended by a further month. Edgbaston's Labour MP Preet Gill says her constituents are understandably concerned about how many flights would be passing above them and the likely impact in terms of noise and pollution. These are concerns which span the opposite ends of British politics and of the runway itself. The airport itself is in the Meriden constituency of Conservative MP Dame Caroline Spelman. She was distinctly unimpressed by the airport's handling of an earlier consultation on similar changes to the south of the runway. She says meetings were cancelled at short notice even though local people had the right to have their voices heard. The airport's chief operating officer David Winstanley denies the extension to the consultation period is an admission they did not get it right first time round. He says the airport has been entirely open with communities about who would see more air traffic and who would see less. We found a variety of views when we canvassed people on the streets of Erdington underneath one of the airport's busiest flight paths. One man told us he was often woken-up early in the morning by aircraft taking-off. A woman said she had got used to the planes going overhead. And another, that she quite enjoyed watching them! What we are seeing here is a classic example of how a strategic 'grand design' introduced for the greater good can nevertheless have a disproportionate impact on a significant minority. And that's what makes it a tricky political issue. So it will be one of our main talking points in this weekend's Sunday Politics Midlands. Joining me in the studio will be the Conservative MP for Rugby, Mark Pawsey, a member of the Commons Communities and Local Government Committee. And the Labour MP Valerie Vaz whose Walsall South constituency is among the places which would no longer lie under one of the main climb-out tracks. And I hope you will join us too, in our usual 11.00 slot on BBC One in the Midlands this Sunday 22 October 2017.